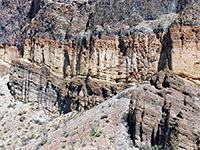 The Burro Mesa Pouroff Trail is a short, easy hike to an unusual canyon feature, in desert terrain half way along the Ross Maxwell Scenic Drive, the access road to the southwest section of Big Bend National Park. Shortly after the road descends from the foothills of the Chisos Mountains after Sotol Vista Overlook into the flatter land below, a short side road forks north for 1.5 miles to the trailhead. 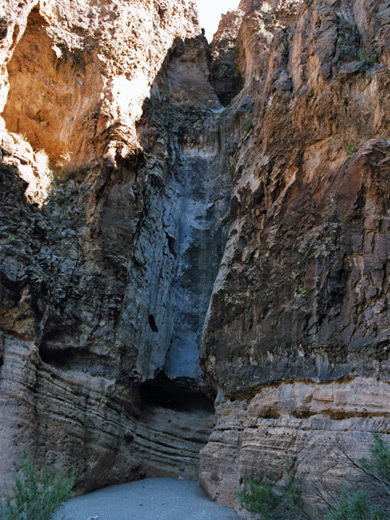 From here, a well-used 0.5 mile path winds through a sandy area with cacti and bushes then follows the course of a dry streambed to the base of a high, vertical cliff, where the occasional flood waters pour down from a narrow slit in the rock, about 100 feet above. The stream has carved a smooth channel in the cliff face, exposing pretty colors and strata, and the location is quite photogenic. 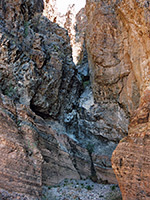 A separate, rather longer trail beginning 5 miles north along the main road follows the streamway (Javelina Wash) downwards, ending just above the dryfall; there is no easy way to link the two paths due to the sheer cliffs below and at either side. A few hundred feet west of the pouroff is a similar, but less high feature along a tributary drainage, which is also quite easily reached by scrambling up the rocky streambed. A round trip to either location takes only 30-40 minutes. Overall, this area is also notable for the interesting forms of the surrounding eroded cliffs - formed of a mixture of brownish tuff and darker, harder trachyandesite - and the abundance of collared lizards, a species with distinctive blue coloration.